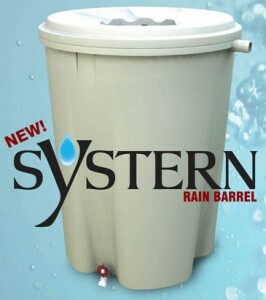 Rain Barrels will be available at our 2019 Truckload Sale on May 5th for $60. Winterizing Your Rain Barrel: If you have purchased a rain barrel – please note that it should be EMPTIED out prior to freezing temperatures. Allowing the water to freeze inside the rain barrel can cause the plastic to crack. The SYSTERN Rain Barrel can lower municipal water demands and save energy at water treatment facilities by reducing water pollution and storm water runoff. Rain water, free from chlorine and water treatment chemicals, is an excellent water source for lawns, plants and gardens.